The ‘Pink City’ of Rajasthan or Jaipur is a major tourist destination of the country, which have grand Rajput palaces, forts, cultural ethnicity, princely ambience and amazing colorful markets, scattered everywhere around. In Jaipur, one can see a very beautiful and lively picture of the Pink city showing its hospitality which provides one a comfortable vacation as well. The temples of Jaipur also attract tourists in large numbers. Jaipur is also known as Choti Kashi because there are approximately 3500 temples in Jaipur. Some of these temples are more than 100 years old. You can find a temple at every little distance. Saint Galav Rishi temple: This temple is made between two cliffs of a rock valley and the steps in this rock valley lead to the Shrine of Rishi Galav and God Hanuman Galta Temple is an ancient Hindu pilgrimage site which is surrounded by Aravalli Hills. A saint named Galav spent his whole life in search of truth and thereafter this place is known as Galtaji. It has a Galta Kund which is a holy water tank and the water of the tank never dries. Taking bath in this holy Galta Kund is considered as pavitra. There are many other temples are also located in Galta ji. One important fact which is linked with this temple is that some part of Ram Charit Manas i.e. Ramayana is written in this temple by Goswami Tulsidas. 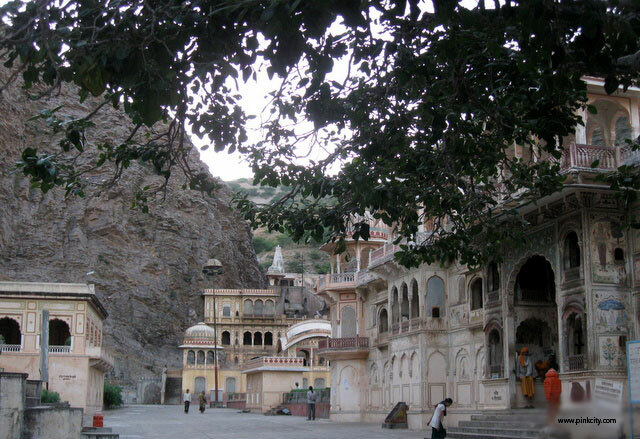 Galta Ji is located 20 kms away from Jaipur. It is said that the Galta kund has curative powers and because of it this is known as pilgrim centre. There is a small temple of Sun god which is built by Diwan Kriparam and is located on the top of the highest peak. This temple is seen from all parts of the city. In the mid of the hills, beyond the gardens there is a low hill where the old pilgrim centre Galtaji is. It is a sacred place for the Hindus as Hindus are mostly dedicated to Sun God. In the Galta Kund, freshwater spring seeps through the rocks in the otherwise dry valley. The fresh water is kept in two tanks. This temple is situated at the bottom of the hills in a lush landscape of trees and bushes. Image of Brahma, Vishnu, Parvati and Ganesha are also made on the walls of this temple. It is said that Galava rishi has done severe penance in Galta ji. There are pictures in the temple which shows state occasions and festival celebrations, polo match of maharajas and rasleela of Lord Krishna and Gopis. Brahma temple is located in the Galta ji and was built in 14th century and this is the only temple in Jaipur which is made in dedication to Lord Brahma. This temple is located on a high hill with marble steps are made which are leading towards this temple. A beautiful turtle is also located on the floor of this temple which has face towards Garbha Griha. The floor is fully made of marbles which is embedded with large number of silver coins as well as donor names are also written on them. The Vishnu temple is also there in Galta Ji and was built in the late half of the ninth century. This is a Hindu temple dedicated to Lord Vishnu. It is known for its architectural beauty. Now, the temple is withered by the passage of time. There was a tower in the shrine of the Vishnu temple which is now damaged. These temples in Galtaji are a major source of attraction as it is a pilgrimage site and people comes here to get rid of their sins. This place attracts tourists not only from India but also from other countries in large numbers.